Trump: I’ll find the money elsewhere. 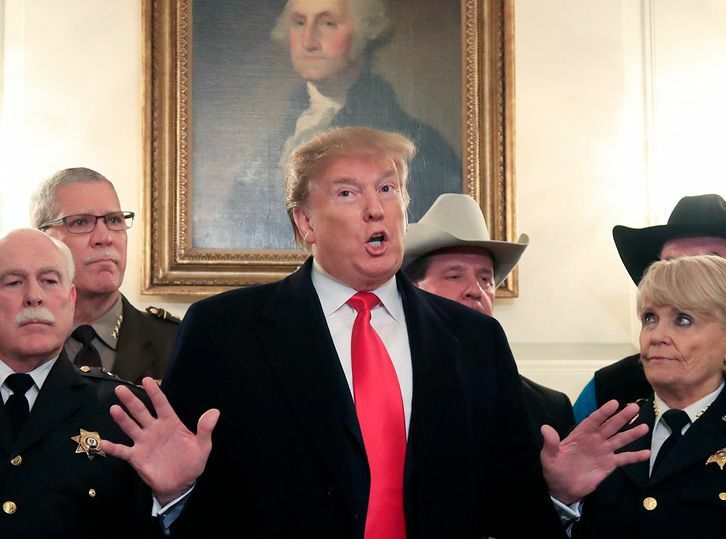 President Trump this week insisted that he would find some way to fully fund a wall on the southern border even as he prepared to sign a congressional border security bill that would only pay for 55 miles of new fencing along the 1,954-mile boundary with Mexico. The bipartisan bill worked out by congressional negotiators to avoid another partial government shutdown includes just $1.375 billion for border fencing in Texas, much less than the $5.7 billion Trump demanded for building more than 200 additional miles of a steel-slat wall. But with the bill expected to pass both houses of Congress, Trump grudgingly admitted that he had little choice but to support it. “I don’t want to see a shutdown,” Trump said. The bill includes several concessions from Democrats, who backed away from House Speaker Nancy Pelosi’s insistence that the border deal not include even one dollar for new barriers. Democrats also dropped a demand to dramatically slash the number of beds for detainees held by Immigration and Customs Enforcement, from 49,000 to as low as 16,500, in order to force ICE to focus on detaining illegal immigrants who have committed crimes. Instead, the bill cuts the number of beds down to 40,000. A frustrated Trump vowed to find “other methods” for building the wall. That could involve declaring a national emergency and redirecting existing funds, including for the military and disaster relief—which would almost certainly bring legal challenges.